Japan has accused China of violating its airspace for the first time after a Chinese government plane flew near disputed East China Sea islands. Fighter jets were scrambled after the plane was seen around 11:00 local time (02:00 GMT) near one of the islands, spokesman Osamu Fujimura said. Japan lodged an immediate protest with Beijing, he said. 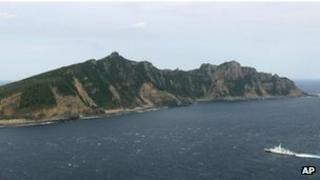 The islands, known as Senkaku in Japan and Diaoyu in China, have been a long-standing source of tension. A total of eight F-15 fighters were sent after reports of the presence of the plane, which belong to China's State Oceanic Administration - a state body tasked with law enforcement in Chinese waters. Japan's defence ministry said it was the first intrusion into Japan's air space by a Chinese government aircraft since the military began keeping records in 1958. Last year, Japan said two Chinese military planes flew near the area, but did not enter the country's airspace. This looks very much like a carefully calibrated escalation by China of the island dispute. The plane flown over the disputed islands was small, propeller-driven and non-military. When challenged by Japanese fighter jets, the pilots of the Chinese plane replied that it was Chinese airspace and the Japanese planes should leave. China's plan appears to be to gradually establish a de facto presence in the waters, and now the airspace, around the disputed islands. Eventually Beijing may believe it will lead to de facto control. The statement from China's foreign ministry certainly seems to back this up. It called on Japan to "halt all entries in to water and airspace around the islands". But if Beijing thinks Japan will capitulate in the same way the Philippines has over Scarborough Shoal atoll in the South China Sea, it is almost certainly wrong. Tokyo has made it very clear it will not give up the islands. Japan has a large and powerful navy and air force. This is a game with high stakes and is potentially extremely dangerous. Mr Fujimura called the incident "extremely deplorable", saying it followed a report from the coast guard that Chinese surveillance ships had also been seen in waters near the islands earlier in the day. "It is extremely regrettable that, on top of that, an intrusion into our airspace has been committed in this way," he said. The Chinese ambassador in Tokyo had been summoned to hear a formal Japanese protest, he said. China's Foreign Ministry spokesman Hong Lei, however, said during a regular news briefing that the plane's flight was "completely normal". "The Diaoyu islands and affiliated islands are part of China's inherent territory," he said. "The Chinese side calls on Japan to halt all entries into water and airspace around the islands." Japan controls the islands, which are also claimed by Taiwan. Close to strategically important shipping lanes, the waters around the islands also offer rich fishing grounds and are thought to contain oil deposits. The dispute over their ownership has rumbled for years but the Japanese government's acquisition of three of the islands from their private Japanese owner in September sparked a renewed row, triggering a diplomatic chill and public protests in some Chinese cities. Since then Chinese ships have been sailing in and out of waters around the islands, prompting warnings from Japan. It is not clear whether this is a move by the Chinese side to escalate the dispute, or a one-off event designed to remind Japan of unsettled history, says the BBC's Rupert Wingfield-Hayes in Tokyo. Today marks the 75th anniversary of the start of the Nanjing massacre, where Japanese troops killed tens of thousands of Chinese civilians in China's old capital, Nanjing, in 1937. The incident also comes days before a Japanese general election thought likely to result in a change of government in Tokyo.